This may have been a match that Korea were expected to win comfortably, but Korea’s possession play certainly bodes well for the future. Manager Uli Stielike decided to omit Premier League stars Son Heung-Min and Lee Chungyong from the starting line-up, and decided that Hwang Uijo’s impressive form for Seongnam was enough to earn him another start over Suk Hyunjun. Korea started patiently against Myanmar, keeping hold of the ball and passing it around the back with Vissel Kobe midfielder Jung Wooyoung playing as the lynchpin between the defense and midfield. This approach was noticeably different from how the team played against Laos, where they opted for a slightly higher tempo and looked to run at players more. Myanmar tried to nullify Korea’s passing game, moving the energetic defender David Htan into an advanced defensive midfielder role, looking to put pressure on Jung Wooyoung and prevent Korea from playing their short passing game. However Korea’s possession play eventually paid off, pulling the Myanmar players out of position and allowing Lee Jaesung to get on the end of a ball over the top from Ki Sungyueng to put Korea ahead in the eighteenth minute. Korea could’ve made it two-nil when they were awarded a penalty a few minutes later but Jang Hyunsoo’s spot-kick crashed against the woodwork and came back out to cheers from the large away contingent behind the Myanmar goal. It didn’t take long for the home side to extend their lead with FC Augsburg midfielder Koo Jacheol confidently heading home from a cross. Myanmar started the second half brightly and had a few half-chances to pull a goal back. 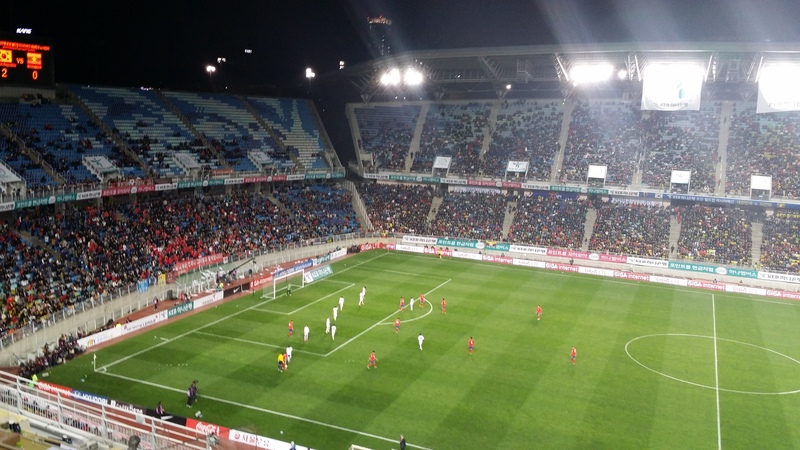 Midway through the second half, there was a huge roar from the crowd as Son Heungmin was introduced to the action. He and fellow substitute Nam Taehee had a part in Korea’s final two goals. In the eighty-second minute Jang Hyunsoo got on the end of a Son Heungmin freekick to redeem himself for his earlier penalty miss and put Korea three-nil ahead. A few minutes later, Son got another assist, playing Nam Taehee through for the substitute to add a fourth goal. The match finished four-nil, another three points and another clean sheet for Korea who have looked defensively very sturdy under Uli Stielike. They will play their final qualifier next week in Vientiane against Laos, where they look to pick-up their sixteenth win of the calendar year. and for those pressed for time, video highlights of the game from Naver (which didn’t include Jang’s PK miss), you can find that here. Thank you for the match review! What did you think of Ki Sung-Yeung playing the full 90 – is Uli in danger of wearing out Ki when he has to fly back and help Swansea pull out of their rut with Bournemouth and a Klopp helmed Liverpool in the near future? I think he will rotate a lot of players for the Laos game. Don’t know if Ki will be one of the players rotated but the Myanmar game was played at a slower tempo than the EPL is played at so I’d imagine Ki will be fine either way.